The Aprilia Futura’s engine management system is able to self-diagnose faults (well, some of them, at least!) and tell you what’s wrong with it. If an EFI fault is present, the EFI light will flash. To find out what’s wrong, you’ll need to put the bike in diagnostic mode. To do this you join up the two connectors hidden under the seat near the battery on the right of the bike (as you sit on it) then switch the bike on with the key. A readout of the appropriate error code will appear on the dash where the clock normally displays. 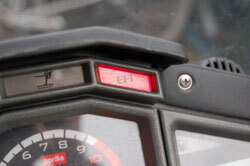 A code reading 1 or -1 means the bike has not detected any of the above errors and activating the kill switch will also set off the EFI light, causing mild panic until the rider realises what’s happened – it’s easy to do accidentally.